I'm not too proud to admit that I'm a vacuum snob and a Shark fanatic. This is actually the second Shark I've owned (I won't however confess how many vacuums I've owned though). I have to say this one is my favorite of the two I have because of how convenient it is. This would have made the perfect vacuum when I was in college. I actually shared an apartment for a year with a friend and we had everything imaginable to clean. Steps, hardwood flooring, and carpet. Yeah all that in one apartment. I hated it because we only had one upright vacuum to try and use to clean it all. Not easy to use at all on the multiple surfaces. Thankfully now days there are vacuums made just for all those surfaces, and as one unit like the Shark Rotator Powered Lift-Away Speed™. At first I was a bit intimidated by the vacuum and all of it's options. Once I read over the included brochure and I put it together a few times with the different attachments I learned it was a breeze. It's actually quite easy to change the floor heads and to switch it from an upright to a lift-away. I have to say the hardwood floor cleaning option paired with the Dust-Away™ Pro cleaner head is a great combination. The microfiber pad picks up and wipes away fine debris that sometimes gets left behind leaving you with super clean floors. It's a bag (or should I say bag-less) mix of emotions seeing all of the dirt and debris it picks up. Living in a tri-level home with not one but two sets of stairs makes me ever so thankful that I can lift off the main unit from the vacuum head and leave behind the added weight when sweeping the stairs. The crevice tool even has a neat sliding duster head you can use too. 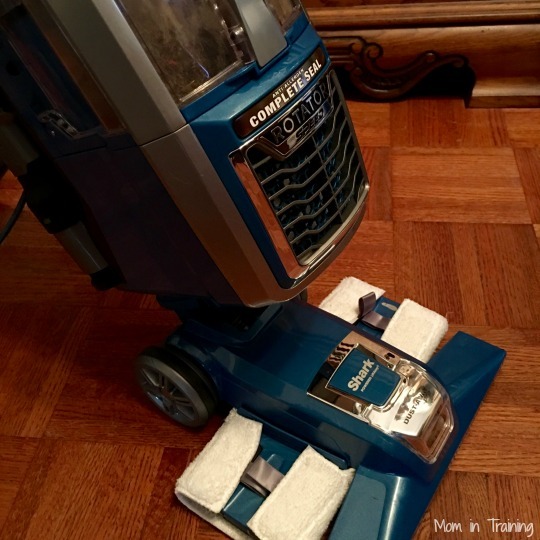 It's really the perfect combination and makes cleaning your steps (and beyond) super easy and convenient. I could honestly go on and on about all of the things I like about my new Shark vacuum. I guess you could say I've found the perfect cleaning mate for my house. 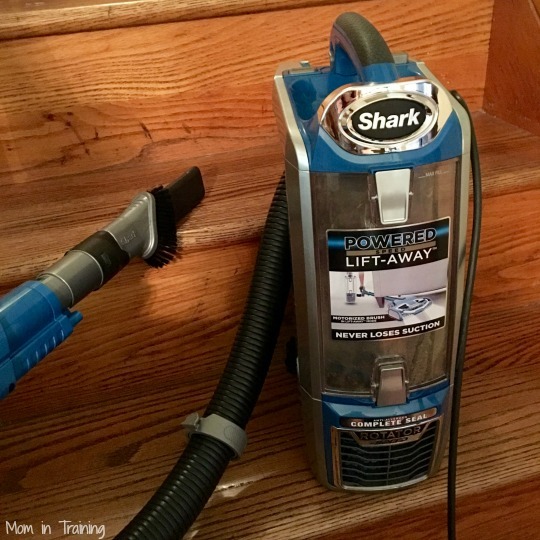 If you have multiple flooring surfaces I highly recommend this Shark vacuum because you definitely won't be disappointed. Shark Rotator Powered Lift-Away Speed™ is a versatile vacuum providing uninterrupted floor to ceiling cleaning. Easily clean under furniture, above the floor, and all those other hard to reach places around your home. Multi-purpose cleaning attachments are perfect for above-floor cleaning – from upholstery to furniture to tight spaces. The floor nozzle includes LED lights, illuminating your work area and making hidden debris easy to find. The fingertip floor controls on the handle make the transition between hard-floor and carpet cleaning seamless. Included is the Dust-Away™ Pro cleaner head, which offers incredible hard-floor cleaning experience with a microfiber pad to pick up and wipe away fine debris. It also features a duster crevice tool - combination crevice tool and fine dusting brush, and a Pet Multi-Tool 2-in-1 tool – combination coarse dusting brush and upholstery tool for versatile cleaning. I wish I could have this! It would make cleaning so much simpler! This is a very nice vacuum. I have never owned a Shark,but this one is very good. I would like to get one of these next time I need a new one! I hear Shark vacuums are a good brand to go with! This looks like it would be great at sucking up the dirt in my house! Would love to own it! It is a worthwhile investment to buy a quality vacuum like this one. This would be a nice way to deal with pet hair. I've had terrible luck with vaccuums. I'd be willing to pay big bucks for one that will both work and last. I'd love to have one of these for my stairs. Thanks for sharing! Love the review. I just bought the Shark 360. This one was on my list also. I like the variety that the Shark® Rotator® Powered Lift-Away™ Speed offers but mostly I am interested in the Pet Multi-Tool 2-in-1 tool. Our newly adopted rescue dog has added a whole new cleaning challenge... hair, hair - everywhere! Oh I have heard so much about the Shark cleaners, this looks so amazing! I love that it has the swivel steering! That would be so wonderful to be able to turn and really clean all your carpet areas! Great vacuum, this would come in handy at our house. We have a mixture of floor coverings, hardwood, many types of carpet, linoleum and tile. There are also two kittens shedding everywhere! Wow! This vacuum sounds like a real work horse! I really like that the floor nozzle includes LED lights! What a great looking vacuum, I love how easy this vacuum is to use and its really nice that's light weight making it easy to manage. Would love to use on my wood floors! I like that you can take only part of it up to clean stairs. That would be a big plus for me. I have been considering this vacuum for quite some time and am so glad to have found this review. I can't wait to get one as well. OH I love this! And i have a lot of stairs so that function is awesome. I hate lugging everything one step at a time.